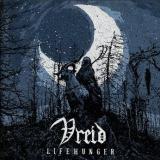 Following a string of highly-regarded albums about the Norwegian Resistance in World War 2 with some less well-received albums that experimented with their sound in subtle but unsatisfying ways, Vreid often feel like a band struggling to regain past heights. As one of the minority who did enjoy albums like V and Welcome Farewell, I feel for the band, who are destined to be forever remembered for the circumstances of their birth after the tragic death of former bandmate Valfar and the subsequent laying to rest of Windir. There's nothing actually wrong with Vreid's later releases except for the lack of the spark that made their earlier works so special, and (especially on 2015's Sólverv) the sense that the creative drive was running out. Fortunately, Lifehunger is very creative, although past critics of the band may well not appreciate this, and not all of the experiments work as well as intended. To get the biggest failure out of the way first, the band have made the same mistake that Satyricon and Watain did on past releases and made a kind of gothic metal ballad that stands awkwardly out from the rest of the album. Hello Darkness, featuring Sólstafir mainman Aðalbjörn Tryggvason on clean vocals (whose voice I'm not especially fond of) feels very out of place and is not especially interesting, relying far too much on repetitive mid-paced riffing that feels a bit too Satyriconny for comfort. Also, is that a cowbell?! Just not a very good song all-round, sadly; the good news is that the band surround it with far superior material based around the prog-tinged melodic black metal that we know and love them for. The best moments on the album are where the band are at their heaviest and most black metal - 'the galloping black-thrash of Sokrates Must Die, for instance, could have come from one of the WW2 albums, so intense and ripping is it. First song proper One Hundred Years (after also not-really-fitting acoustic intro Flowers & Blood) is breathtaking when the band drop their restraints and riff their hearts out, adding some classic heavy metal influence in the melodic widdly riffing, and even the clean-sung chorus works well in situ. If Vreid have a fault its being a bit too fond of the acoustic interlude, like Opeth from twenty years ago - there's nothing actually wrong with the implementation here, it's just going to the same well a little too often. Speaking of Opeth, the chugging intro to the title track here is downright paying homage to how the Swedes' Sorceress title track used similar-sounding riffs, although fortunately the Norwegians soon pick up the pace and turn things black-thrashy. Certain bands like Opeth and Enslaved will always be touchstones when looking for prog metal touchstones, and Vreid do indeed touch upon them, but melodic black metal bands will always be best when looking back to the likes of Dissection or Necrophobic, and accordingly the later part of the title track and The Dead White are more highlights. To be fair to Vreid, they are still very much a black metal band, as they prove time and time again here, not least on the parts of Black Rites in the Black Nights where vocalist Sture isn't snarling the title name. It hits a nicely atmospheric note in its closing moments, matched by closing instrumental Heimatt which adds a few more progressive meanderings that don't hold it back from a near-epic feel. Nearly a terrific album, then, let down by a couple of missteps, but still worth your time.